The articles collected here tell the story of the workers’ revolt against Stalinist rule in East Germany sixty years ago, in June 1953, and the responses of the “Third Camp” Trotskyists of the Independent Socialist League. Three further articles, written between 1946 and 1954, set out the theoretical framework by which the writers understood the imposition of Stalinist rule in Eastern Europe after World War Two; and a final article, written just before the German events, sums up what socialists should learn from the experience of Stalinism. Like a brilliant gleam of light in the gathering darkness of the post-war years, the rising of the German working class has already shattered myths and shamed despair. It has already answered a host of questions that had been posed by those who became panic-stricken before the seemingly invincible strength of Stalinist tyranny. While the sharpest struggles in East Berlin have been lulled, resistance action in the whole of the East German zone, which followed hard in the wake of the Berlin rising, is still continuing with at least sporadic strikes and riots. The Russian occupation authorities have formally executed 22 so far. The first was a West Berliner, Willi Goettling; the twenty-second was the CP mayor of Doebernitz, in Saxony-Anhalt, H W Hartmami, who was accused of knocking down a Volkspolizei cop who had fired or was about to fire into a crowd of demonstrators. The unthinkable took place in East Berlin and East Germany: the working class of a totalitarian country, where 30 Russian divisions are stationed, where the Communist Party disposes of all the levers of control, revolted against an implacable dictatorship, left the plants and building-yards, invaded the streets and public places, to cry out their anger and demand — what? Higher wages? No: to demand freedom. This exploit was accomplished by a working class which suffered through 12 years of the Hitler regime, war, and eight years of the “People’s” regime and the Soviet occupation. 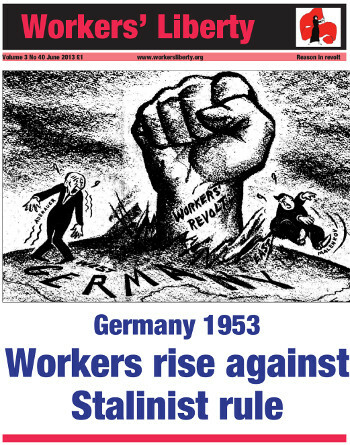 The June uprising of the workers in East Germany is one of the great events in modern history. The uprising in Germany will open up new historical opportunities which seemed to have vanished with the defeat of the European labour movements during the last twenty years and the emergence of the Stalinist state. There have been anti-Stalinist actions before, both outside of Russia and even inside of it. But yet they are not the same thing as the rising that occurred in Berlin. The June uprising of the East German workers demonstrated to the world — and to Moscow — that the Grotewohl-Ulbricht regime was built of sand and rested on water. Since it could no longer pretend to represent anyone but its Russian masters, its usefulness as a pawn in Moscow's game to draw Western Germany out of the American orbit seemed at an end. The bad blood in Big Three relations that came to public view during the London Conference of Foreign Ministers in September, 1945, reached its boiling point last month as the world lived through a war of nerves reminiscent of the Munich days. [In March 1946 the Greek civil war restarted; there was British-USSR tension in Iran; and Winston Churchill made a speech putting the turm “Iron Curtain” into currency]. There is a paradox — only an apparent one — in the development of Stalinist imperialism. Stalinism arose out of the counter-revolution in Russia under the slogan of building “socialism in one country” as against the perspective of “world revolution” represented by the Bolshevik left wing under Trotsky. An historic internal struggle took place within the party under these different banners, in which, as everybody knows, the Stalinist wing won out.